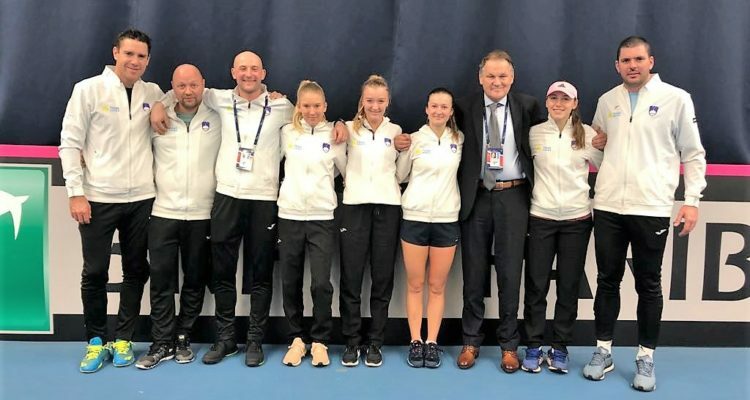 Slovenia secured his spot in the Fed Cup by BNP Paribas Europe/Africa Zone Group I. The team from Central Europe beat Georgia 2-0 in the relegation play-offs on Saturday afternoon at the University of Bath, Great Britain. Kaja Juvan benefited from the retirement of Miriam Bolkvadze leading 6-1, 3-0 in the opening match. Slovenia’s No. 1 Dalila Jakupovic defeated Ekaterine Gorgodze 6-4, 6-4 in the second singles rubber. “I’m glad that I won. I started poorly, but with the support of my team the match turned to my advantage. I want to win as many matches as possible next year in order to qualify for the next level,” Jakupovic stated. Earlier this week, Slovenia lost their first three ties in Pool A against Great Britain (0-3), Hungary (0-3) and Greece (1-2). Hosts Great Britain beat Serbia 2-0 in the promotional Play-Off to crown an unbeaten week in Bath to reach the World Group II Play-Offs in April. This entry was posted in Fed Cup and tagged Fed Cup, Slovenia.